My Buddy Knows the answers…Do you? 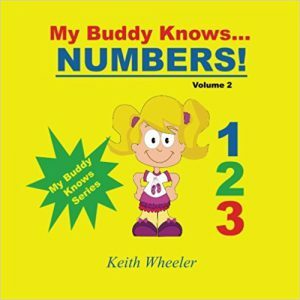 Meet author, Keith Wheeler and learn about his newest books My Buddy Knows…Letters & My Buddy Knows…Numbers. Keith Wheeler is the International #1 bestselling author of the “My Ultimate Journal” series(a collection of softball-themed journals) as well as the “My Buddy Knows” children’s picture book series. Keith is a family man in every sense of the word. Married to his high school sweetheart since 1997, he has amassed a tribe of four children in Missouri, USA. When joined with a lifetime love for writing, a children’s picture book was inevitable. The My Buddy Knows series looks to replicate the early learning technique of flash cards in book form. The idea is wonderfully simple. The My Buddy Knows series is a series of children’s read along picture books. These fun and exciting books take the traditional method of learning through children’s books and adds a unique spin. By incorporating a flash card-like format, these books give the child the opportunity to become more involved in the learning experience. In My Buddy Knows Letters, children are introduced to our buddy, Josh. This blue-haired, sharp-dressed character will introduce the reader to an object with the catchphrase, “My Buddy Knows”, then a picture of the item, followed by “starts with…”. The reader then decides what letter that object starts with. Once they think they know the answer, they can flip the page and see if they’re right. In Volume 2, My Buddy Knows Numbers, children are shown a picture and can decide how many items are in the picture. Then, they simply turn the page to see if they were right. Using this unique layout to not only familiarise the child with their numbers but specifically counting. 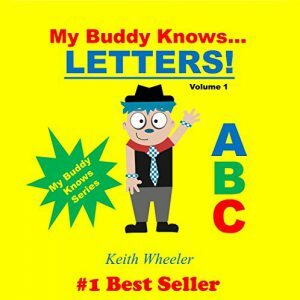 In this interview Keith talks about both the books in My Buddy knows series, My Buddy Knows…Letters, My Buddy Knows…Numbers & describes the main character,his strengths & what sparked the initial story idea for these books. Keith also gives us a sneak peek into what he’s working on now & much more. Tune in to this episode to get great advise shared by Keith & Jed! Be sure to grab your copy of My buddy knows today & begin your kid’s journey of learning letters & numbers in the most fun & entertaining way! Check out The Great Martini, A fun and touching story about Sam, a lovable but far from perfect magician who learns that the greatest transformation is transforming feelings of caring into action to help another human being. The Great Maritini, as an exclusive amazon e book.Please click here to get your copy today. Read NextWelcome To A World Of Wonders!! !